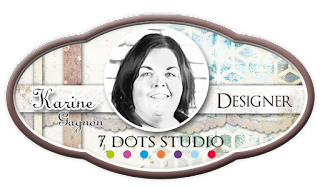 I'm here today to share with you my monthly layout for 7 Dots Studio. It is called «Sharing is a Key to Happiness». Let's look at it. I started out with the Starlight paper from the Northern Lights collection. I covered it with a coat of clear gesso and some white gesso on the center to tone down a bit of the pattern where I planned to built my layout. Next, I used the Writers Block Letters Stencil with Art Alchemy Ice Queen Metallique Acrylic Paint by Finnabair. I used the new stencil brushes also by Finn to apply the paint through the stencil. The effect is soft: I like it. 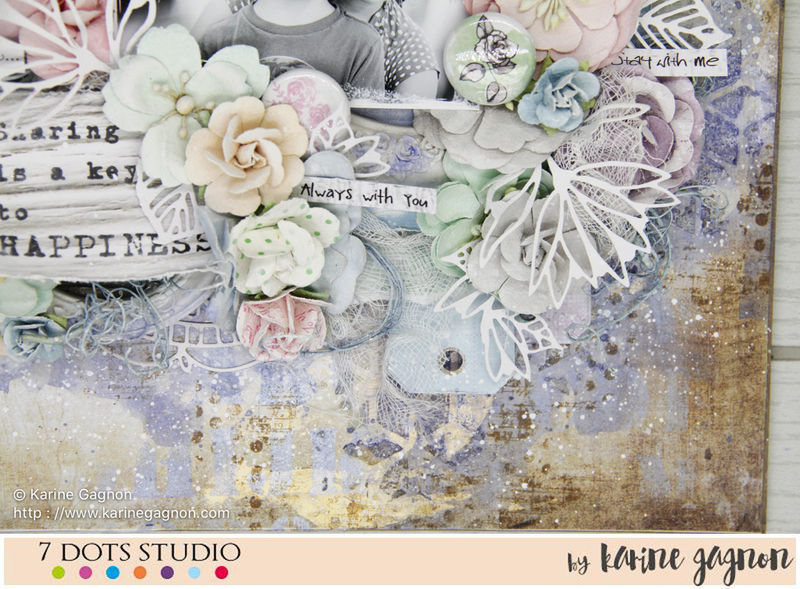 To add even more texture to my background, I used the Dreamscapes Geometry Stencil with White Sand Texture Paste. When everything was dry, I used a mix of watercolors to achieve this purpulish color that I applied over the dried paste. 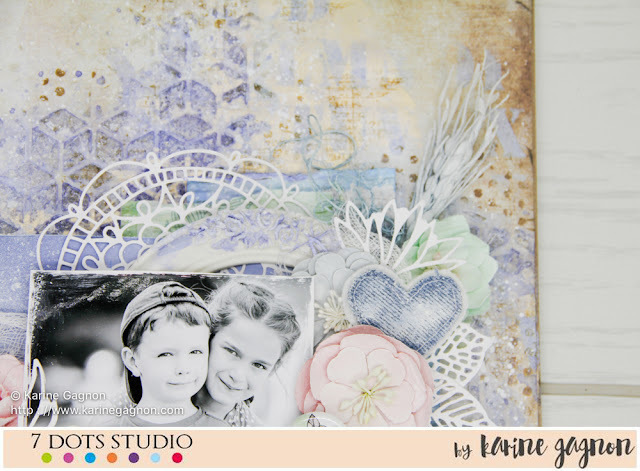 I love how it makes the texture of the paste more visible. After that, I stamped with the Lost and Found Clear Stamps and the Writers Block Clear stamps. 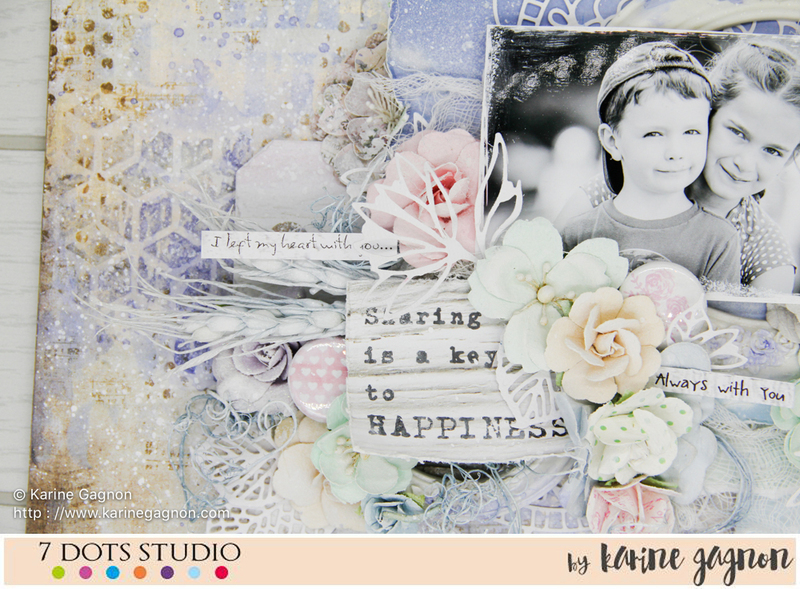 I used brown archival ink, to get a softer look to match the layout. 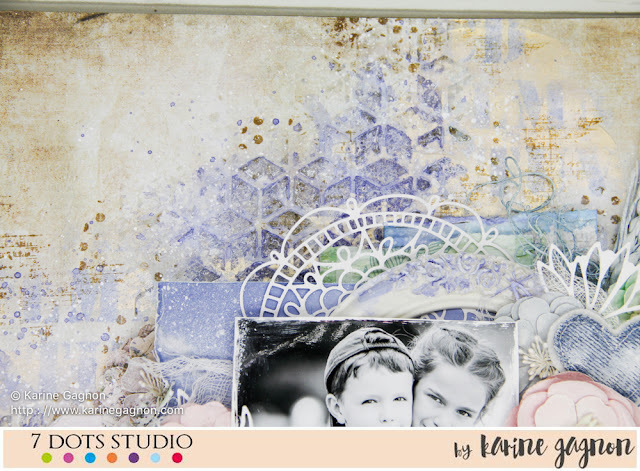 I used pieces of the Celadon and White Plank papers from Verano Azul along with the 12x12 tags from Verano Azul to build my paper cluster. 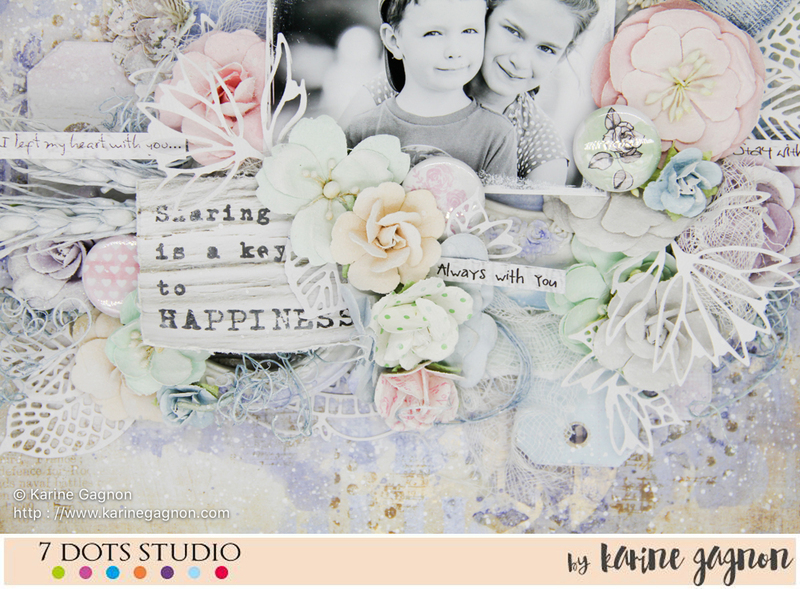 I even chose to cut this beautiful quote from the White Plank paper and make it my layout title. I thought it matched the picture perfectly. I also used the Cold Country Word Stickers 6x12 here and there in my embellishments clusters. 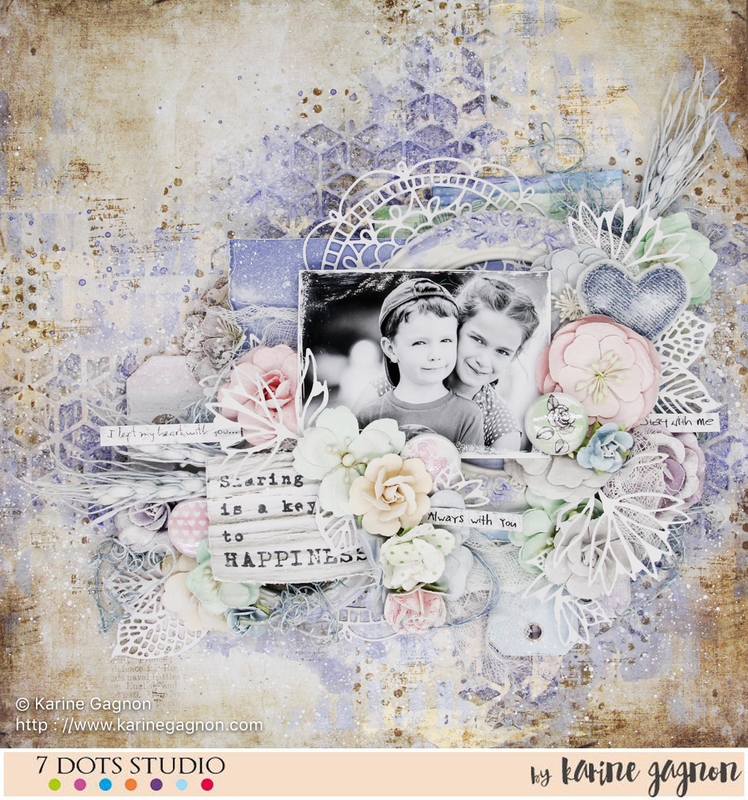 With this layout, I would like to enter the January Mixed Media and Art challenge. 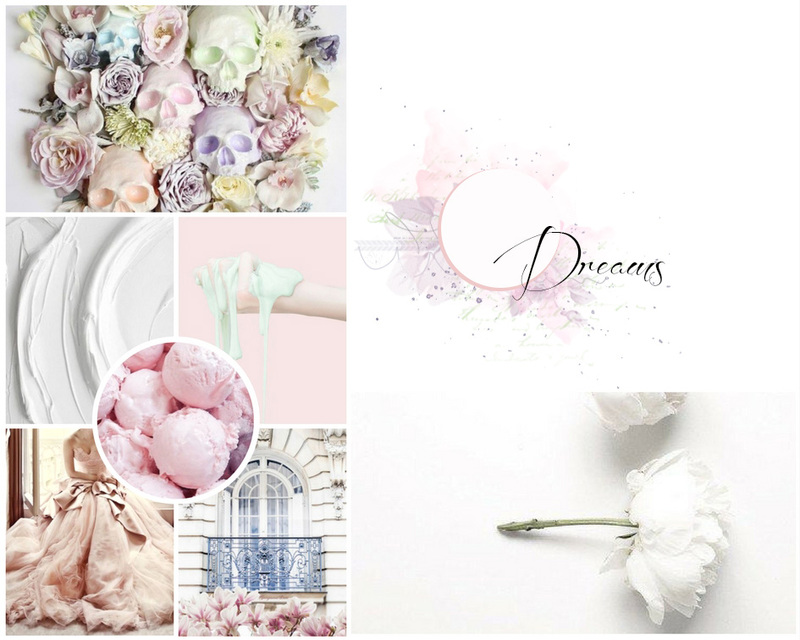 I was inspired by the colors of the moodboard.